Pests & diseases: Soil borne organisms attack specific crops & can build up. Examples include scab & eelworm affecting Potatoes and club root affecting the cabbage family. Moving crops into a different bed each year breaks the lifecycle of these organisms because they cannot survive without the host plant. Nutrients: Different crops take different amounts of each nutrient from the soil and without any action localised deficiencies can occur. The object is to even out nutrient take up across the plot and maximise the benefit of whatever compost or manure you have available and this governs the sequence of crops. Year 1. Potatoes need rich, water retentive soil so start with adding organic matter to the bed before you plant them. Year 2. There will be enough organic matter left in the soil for peas and beans because they have the unique ability to take Nitrogen from the air and they fix any excess in their roots. Year 3. Green leafy crops will benefit from the Nitrogen released as the roots of the previous crop decompose. Year 4. Finally move to root crops that need a very fine soil texture to avoid forking and not too rich a soil to discourage lush leafy growth at the expense of root development. 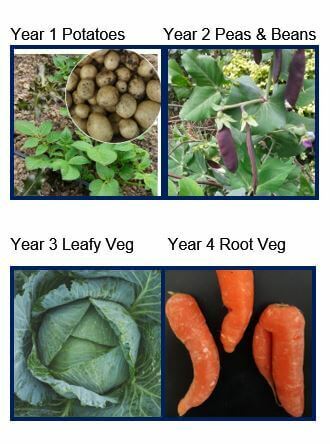 And there you are – a brief explanation of crop rotation and why it makes sense to move your crops around the garden or allotment. If you like this blog post, please follow me on Twitter or Facebook for more hints and musings or join my mailing list for in depth articles and video tips.